The charming and historic town of San Miguel de Allende captures the senses with colorful colonial buildings and a lively arts and culinary scene. Music is everywhere and the air is fragrant with flowers and herbs from the town’s many rooftop, balcony and courtyard gardens. Opened in February 2011, Rosewood San Miguel de Allende was crafted by local artisans with the look and feel of old San Miguel to capture the historical essence and ambience of Mexico’s most beloved city. 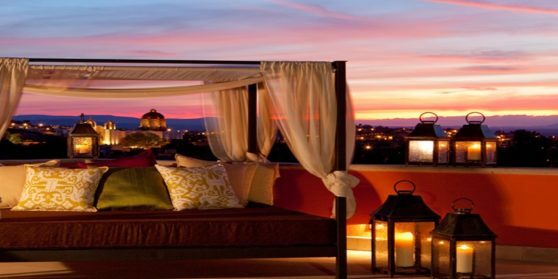 The hotel pays homage to San Miguel de Allende’s storied past while staying true to Rosewood’s philosophy of providing guests with a memorable experience of unparalleled luxury and understated elegance. Awash in the warm, saturated hues so favored by the city, and complemented with colonial-style arches, artisan ironworks and hand-carved wood adornments, the hotel blends seamlessly with the town’s historic buildings, and is reminiscent of a grand hacienda. The warmth of the people and the sheltered setting of this town in the mountains of central Mexico have captured the hearts of visitors for centuries. Founded in 1542 by the Franciscan monk Fray Juan de San Miguel, the missionary town of San Miguel el Grande was an important stopover on Spain’s silver route. San Miguel is considered a remarkable example of 16th-century Spanish Colonial Baroque architecture and also played a vital role during the Mexican War of Independence. To honor its famous son and national hero – Ignacio Allende – the town renamed itself San Miguel de Allende in 1826. In recent decades the natural beauty of the surrounding countryside, quality of light and unique ambience have drawn artists to study, work and settle here. San Miguel was designated a UNESCO World Heritage Site in 2008 for its colonial authenticity and cultural integrity, and the excellent condition of its historic downtown (Centro Historico.) With respect and reverence for the history, culture and creativity of San Miguel, the hotel embraces Rosewood’s A Sense of Place philosophy and reflects the town’s existing charm, scale and architecture. Rosewood San Miguel has an extensive and spirited collection of contemporary Mexican art exhibited throughout public areas of the hotel, consisting of works by prominent artists active in various regions of Mexico and includes a few expatriate artists who have made San Miguel their second home.